The corners of our homes are constantly taking a beating. 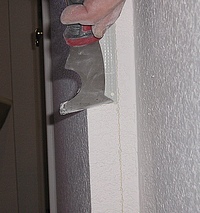 Repairing drywall cornerbead is inevitable. Fortunately, this is an easy fix that anyone can do. The most common types of cornerbead are metal cornerbead with a 90-degree bend and bullnose cornerbead that is rounded. 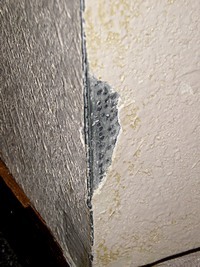 The easiest to fix is the 90-degree metal cornerbead that has come loose, causing a hairline crack that can span the entire height of the wall. Minor damage and missing drywall compound can occur anywhere on a corner and is easy to fix. The patching compound you use depends on the size of the repair. Small areas can be repaired with light weight spackling paste. While larger areas should be patched with the harder setting type drywall compound. All repairs concerning drywall cornerbead starts with removing all loose material. You might be surprised as to how much is actually loose. The entire area needs to be primed, this includes any exposed metal. Use a fast drying-stain blocking primer, an aerosol can of Kilz or Zinnser Cover Stain primer works great. A stain blocking primer can also be brushed. The primer will help the drywall compound stick to the metal edge and keep it from sliding off while being applied. This typical damage can happen to 90-degree metal cornerbead as well as bullnose cornerbead. Utilize a sharp putty knife or multipurpose knife to remove all loose drywall compound. Use the sharp edge of the knife, move it up and down the crack moving toward the corners edge. Once a small section is fully removed, move the flat edge of the knife to pop off any remaining loose compound. Make sure the drywall cornerbead is fully secured. To check for loose areas press on the edges. If there is any movement install drywall nails were needed at the edge. If the nails are driven into the corner with too much force the metal edge will distort. A power stapler can be used instead of nails. After priming the area, its time to tape and finish. Fiberglass tape is the best choice for this type of repair. The best drywall compound for repairing drywall cornerbead is a setting type compound, available as a powder. Center the self-adhesive fiberglass tape over the edge of the cornerbead, lapping the tape onto the wall. Apply a heavy coat of drywall compound to embed the tape. Additional coats of compound need to be thinner and wider, feathering the edge. Finish with a light sanding using a medium-fine sanding block. Now, apply texture to match the existing finish. If the drywall cornerbead has been dented or severely damaged replacement might be needed. Not all dents require replacement, just a little imagination and fast setting drywall compound. Minor dents in bullnose cornerbead. – Apply a setting type compound in two coats. Use a 3 or 6 inch drywall knife and pull the compound across the dent, around the corner. Sand using a circular motion, moving around and over the corner. The idea is to rebuild the shape of the corner. Do not sand in an up and down motion. This will produce flat spots. Apply primer when sanding is finished, an aerosol primer can be used. The primer will show any defects in the corner. Apply more compound if necessary and re-prime the area before painting. Replacing damaged sections of drywall cornerbead. – Replacing a section is the only option when severely damaged. The cornerbead can be cut with a hacksaw and removed. The replacement piece needs to fit exactly or any differences will show. An alternative is to replace the entire piece of cornerbead. This is a better choice for a true repair. Either option involves loosening and removing the joint compound, plus cutting any tape that might have been used during installation. The reinstalled cornerbead needs to be secured with nails and taped in order to provide a permanent repair.